The largest privately owned tropical freshwater aquarium in the UK is to be stripped back after facing exorbitant running costs. Jack Heathcote, owner of the colossal 3.8 x 3.9 x 2m tank in the basement of his Nottingham home, has had to make the decision after being presented with a staggering electric bill. The feature of numerous tabloid articles and TV shows, Jack’s tank has become something of a national aquatic icon, and houses such bruisers as gigantic Pacu, Ripsaw catfish, Alligator gars, Pangasius, Arowana and Stingrays. Understandably, Jack is distraught at this latest development. He tells PFK: "Although I went to no end of trouble to ensure my tankbusters were properly housed, something else has come up to spoil things. It turns out that over the past few years, my electricity supplier has been either reading my meter incorrectly or billing me incorrectly. "I am now involved in a huge dispute with them about all of the mistakes that have been made. However, the trouble is, it turns out that my electricity bill will be around the £6000 mark a year." The huge aquarium is featured in the March issue of PFK, where we visited Jack in late 2013. At that time, he estimated his running costs to be a more manageable £1,600 annually. "Unfortunately, I have done some calculations, and it does work out at this amount. There's over 2kw of pumps working 24/7 on the two big tanks alone, then there's the 6kw Koi heater, lighting, then all of my other tanks. "With all of the best will in the world, I simply cannot afford this. I'm going to have to close the two big tanks down to avoid financial ruin. You'll probably realise that I don't have to explain just how upsetting I find this…"
Jack was caught short by the runaway rises in electricity fees over the last ten years. In this time, he claims, prices have doubled. Rehoming fish from his large marine system should present few problems, but Jack faces different issues with his freshwater trophies. "Suddenly I find myself being one of the people now trying to find homes for a load of giant fish," he says. "I know that public aquariums are full of these and would usually refuse." We suspect that some public aquaria would be more interested in these fish than the usual giants they’re offered. For one, Jack’s fish have been held in larger facilities, and don’t have the errant lumps, bumps and deformities of many UK tankbusters. Some residents have already found new homes. Jack’s Fly River turtles — an incredibly rare species to see traded — have a new tank lined up, and his Alligator gars are headed to a custom built North American display in a large public aquarium. Jack doesn’t think the stingrays will pose a rehoming problem either, as they’re a popular species with keepers and breeders alike. But he does think that he will face some reluctance for anyone to rehome the Pacu and Pangasius. It’s a particularly low blow for Jack, whose ethos throughout has been to provide an ample home for fish that he genuinely loves. From the start, his goal has been to provide an Eden for species that nobody else wants, and it’s now a tragic irony that the very fish he often rescued himself now need rescuing again. As for the future, Jack wonders if it’s still possible to run at least one of his set ups for a lower outlay. "I'm considering running the big tank lightly stocked with native fish, maybe perch, pike, and carp, for example. Then there would be no heating, and I could more than halve the pump power. 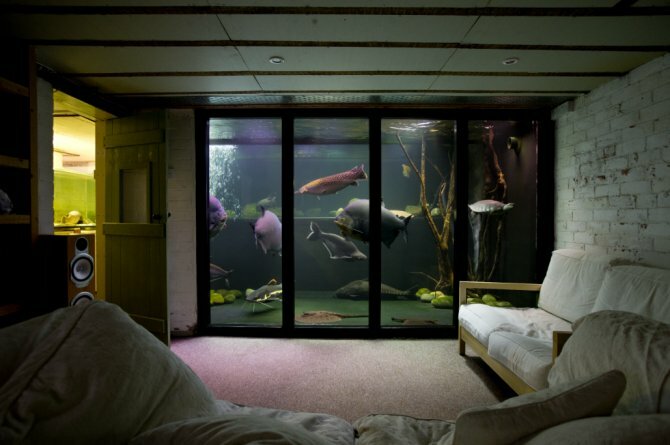 "The marine tank I may turn into a lightly stocked Tanganyika set up for all the same reasons. I've worked out that this would cost about one sixth of what it's costing in electricity now." But at present it looks as though day-to-day expenses have beaten Jack’s ambitions, and for now the focus is on rehoming his fish. Jack’s highest priority now is to find large enough aquaria to suit them, as he’d hate to see any of his pets placed into a smaller system. If you’re a public aquarist interested in rehoming one of Jack’s species, or know someone that is, please feel free to contact the PFK team on nathan.hill@bauermedia.co.uk to have your contact details passed on. One vital stipulation is that any prospective tank needs to be as large as, or larger, than the fish’s current home, and smaller set ups will not be considered.